On the heels of the news that SRO Jess Gilman is returning to Costa Mesa on Monday, there is more good "returning officer" news tonight. 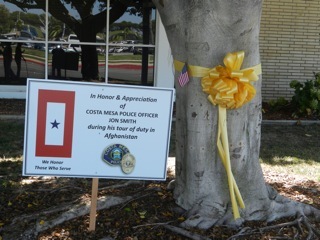 In a press release today the Costa Mesa Police Department announced a "yellow ribbon-cutting" ceremony at 4:00 p.m. Tuesday, January 8, 2013 at which Officer Jon Smith will be officially welcomed home from his recent year-long tour of military duty in Afghanistan, during which he was involved in assessing the capabilities of schools, hospitals and police departments. The event will take place in front of the Police Headquarters at 99 Fair Drive. Police Chief Tom Gazsi will host the event and will be joined by Community Service Specialist Jeanette Chervony who was instrumental in providing Smith strong support by gathering, organizing and shipping special care packages to him while he served abroad. That really is great news, that Officer Smith will be home safely. Thank you also Jeanette, for your efforts to send packages to him and such. Very good on both. Welcome Home, Officer Smith! You have done a good thing for our country. Thank you for your service.